The Hague: Germany started their Euro 2020 qualification campaign with a 3-2 win against the Netherlands in Amsterdam, thanks to a late goal by Nico Schulz. With the Netherlands just out of their soccer crisis with qualification for the Nations League finals last year and Germany right in it with an early exit at the World Cup and relegation to the second division of the Nations League the pressure was on the Germans. Head coach Joachim Loew said goodbye to Thomas Muller, Jerome Boateng and Mats Hummels and thought it was time for a new generation. The new German generation proved themselves from the start in Amsterdam on Sunday. Loew lined up Manchester City''s Leroy Sane and Bayern Munich''s Serge Gnabry as partners in front and their movement caused the Dutch defense a lot of trouble. At first a shot by Gnabry was saved by Dutch goalkeeper Jasper Cillessen and in the 15th minute Sane scored after outplaying Matthijs de Ligt from a cross from the left by Nico Schulz. Ryan Babel had two good opportunities on behalf of the home-team, but his shots were saved twice by German goalkeeper Manuel Neuer. In the 34th minute Gnabry dribbled inside from the left while Dutch captain Virgil van Dijk failed to intervene and Gnabry then curled the ball beautifully into the far corner. With a header by Thilo Kehrer and another chance by Sane the Germans could even have extended the scoring in the first half. However, the second half was a totally different story, with Steven Bergwijn as substitute for Babel. De Ligt headed in a cross by Memphis Depay in the 48th minute and in the 63rd minute Depay found the corner of the goal to make it 2-2 for a dominant ''Oranje''. 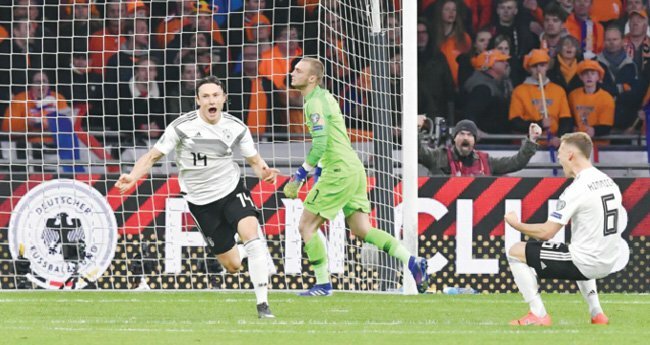 On the day Dutch soccer legend Johan Cruijff died three years ago this seemed to become the final result in the Johan Cruijff Arena, but the Germans came with a surprise in the final minute as substitute Marco Reus found Schulz, who gave the visitors their first win on Dutch soil since 1996. Northern Ireland beat Belarus 2-1 in Belfast on Sunday and now lead Group C with six points. Germany are on three points after one match and the Netherlands, which had started the Euro 2020 qualifying campaign with a 4-0 win over Belarus in Rotterdam on Thursday, are on three points from two matches.